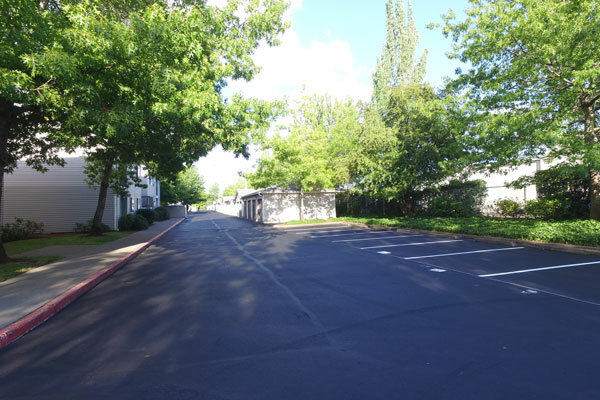 Are you wondering how to extend the life of your asphalt driveway or parking lot? With regular maintenance, Aegis Asphalt can double the life of your investment. On average, quality asphalt pavement can last between 15-20 years. With regular upkeep, we can help your driveway or parking lot last 30 years or more. One of the best ways to protect your asphalt is to prevent water intrusion as much as possible. Due to freeze-thaw cycles, water can prematurely damage the pavement. We recommend maintaining catch basins and bioswales on a yearly basis to ensure proper drainage. Cracks left untreated can lead to further deterioration of your asphalt. Fill cracks as frequently as needed and sealcoat periodically to minimize oxidation. As professional asphalt contractors, we recommend sealcoating only when significant portions of the previous sealcoat are worn off. If you notice unsafe conditions such as potholes, it is critical to repair them immediately before they become worse. We can patch potholes for a temporary solution. Without timely patching, water can enter the subgrade and cause larger and more serious pavement issues. As your asphalt contractor, we will evaluate the condition of your driveway or parking lot to determine the best plan for your needs and budget. Contact us to learn more about our services in Eugene, Roseburg and Coos Bay.